Patients with groin pain that will not go away on its own may be suffering from sports hernia, a misunderstood condition that is often not properly diagnosed by doctors unless they are familiar with athletic pubalgia, the medical name for sports hernia. 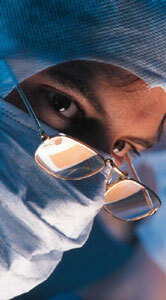 Sports hernia is not a true hernia that involves a bulge. Rather, it is tear or weakness where muscles join at the pelvis. During sports like football, soccer, hockey, tennis, and running where the body twists or turns, two muscles can oppose each other to cause a strain or tear. 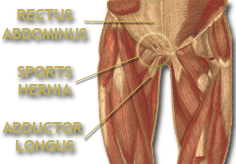 The rectus abdominus muscle across the belly and the adductor longus muscle in the upper thigh join at the pubis, a bone in the low abdomen. When the muscles are pulled the result can be a sports hernia, chronic radiating pain felt in the groin, low abdomen or even in the rectal area or testicles in men. No pain may be felt at rest, but during activity the pain reoccurs. Diagnosing sports hernia can be difficult for most doctors because there is no test and a sports hernia usually isn't visible using MRIs or Xrays, which are more useful in ruling out other causes of the pain. An doctor experienced in sports hernia can diagnose the condition through a physical exam and by having the athlete or patient attempt specific exercises. Sports hernia is first treated without sports hernia surgery using four to six weeks of physical therapy. In cases where physical therapy cannot return the athlete to pain free enjoyment of sport, then sports hernia surgery is needed to cure the chronic pain. Sports hernia surgery can be performed with local anesthesia or general anesthesia, usually a personal choice of the athlete or patient. The surgery involves stablizing the muscles where they join the pubis bone, removing a superficial nerve, and strengthening the area with a thin pliable surgical mesh.